1. Each championship contest will be scheduled for twelve (12) rounds, of three (3) minutes duration, and one (1) minute rest period for men. Each championship contest will be scheduled for ten (10) rounds, of two (2) minute duration, and one (1) minute rest period for women. 2. Referee is the sole arbiter of a bout and is the only individual authorized to stop a contest. 4. The 10-point Must System will be standard system of scoring a bout. 5. Mandatory Eight (8) Count after knockdowns will be standard procedure in all bouts. 6. All professional boxers are required to wear a mouthpiece during competition. The round can not begin without the mouthpiece. If the mouthpiece is dislodged during competition, the referee will call time and have the mouthpiece replaced at the first opportune moment, without interfering with the immediate action. Points may be deducted by the referee if he feels the mouthpiece is being purposely spit out. 7. There is NO Standing Eight (8) Counts. 9. A boxer shall receive a twenty (20) second count if he is knocked out of the ring and onto the floor. The Boxer is to be unassisted by his seconds. If assisted by his seconds, he shall be disqualified by the referee. 10. A boxer who has been knocked down can not be saved by the bell in any round. 11. If a boxer sustains an injury from a fair blow and the injury is severe enough to terminate the bout, the injured boxer will lose by TKO. 1: If an intentional foul causes an injury, and the injury is severe enough to terminate a bout immediately, the boxer causing the injury shall lose by disqualification. 2: If an intentional foul causes injury and the bout is allowed to continue, the referee will notify the authorities and deduct (2) points from the boxer who caused the foul. Point deductions for intentional fouls will be mandatory. 3. In an intentional foul causes an injury and the injury results in the bout being stopped in a later round, the injured boxer will win by TECHNICAL DECISION if he is ahead on the score cards or the bout will result in a TECHNICAL DRAW if the injured boxer is behind or even on the score cards. 4. 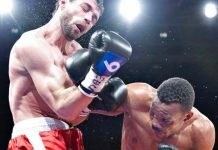 If a boxer injures himself while attempting to intentionally foul his opponent, the referee will not take any action in his favor, and this injury will be the same as one produced by a fair blow. 5. If the Referee feels that a Boxer has conducted himself in an unsportsmanlike manner he may stop the bout and disqualify the Boxer. 1: If an accidental foul causes an injury severe enough for the referee to stop the bout immediately, the bout will result in a No Contest if stopped before four (4) completed rounds. 2: If an accidental foul causes an injury severe enough for the referee to stop the bout immediately, after four (4) rounds have occurred the bout will result in a TECHNICAL DECISION, awarded to the boxer who is ahead on the score cards at the time the bout is stopped. a. Partial or incomplete rounds will be scored. If no action has occurred, the round should be scored as an even round. 13. A fighter who is hit with an accidental low blow must continue after a reasonable amount of time but no more than five (5) minutes or he will lose the fight. 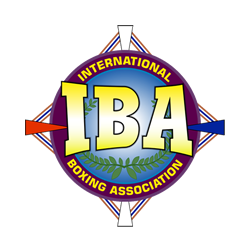 There will be an IBA rules meeting with the boxers and managers prior to the fight. 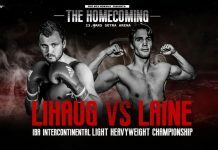 All appeals shall be in writing from complainant or the designated representative and shall be sent to the Chairperson of the Ratings Committee within ten (10) days from the date of the ratings posted on the official IBA website at ibamensboxing.com. Failure to appeal within ten (10) days shall constitute a waiver of the right to appeal. The President of the IBA shall notify the members of the Executive Committee of the appeal and provide each member with all documentation received by the Ratings Chairperson regarding the appeal, as well as a copy of the written justification for the rating provided by the Ratings Chairperson. Any appeal to change a rating under this rule must be approved by a majority vote of the Executive Committee. The complainant will be notified in writing of the results of the appeal within ten (10) days after submission of the appeal to the Ratings Chairperson. 1. No boxer shall be rated in more than one (1) weight division. 2. Ratings must be solely based on win/loss records, level of competition, activity and a boxer’s adherence to IBA rules and regulations. The records of any top ten (10) rated boxer must be verified. 3. For a boxer to be considered for the top ten (10) he must have had at least six (6) professional fights. 4. 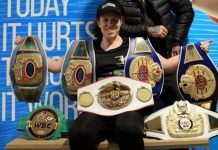 For a boxer to be rated in the top ten (10) and compete for a world title he must have competed in at least four bouts scheduled for (8) rounds. B) Must have competed against another top ten (10) rated boxer within an eighteen (18) month period from the time the boxer gets rated. A boxer who does not meet this level of competition will be removed from the ratings. Exceptions will be made for injuries for a period of up to 90 days with proper medical documentation. 6. If a top fifteen (10) rated boxer loses to an un-rated boxer then the rated boxer shall be lowered or removed from the ratings. The un-rated boxer may be considered for a rating in the top fifteen (10). 7. For a boxer to be rated in the number one (1) or two (2) position he must be rated in one of the top five (5) available positions and beat another boxer rated in one of the top (5) available positions. 8. There are no mandatory defenses for IBA world champions. 9. 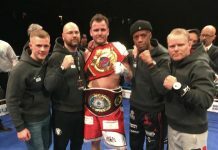 Boxers that contract to fight for other world titles shall be considered unavailable and will be removed from the rankings. 10. It is the responsibility of the boxer’s management to notify the Ratings Committee of a boxer’s activity. 11. All ratings criteria are subject to exception by approval of the Ratings Committee.